Halloween is arguably the most paradoxical of American Holidays despite its ever-increasing popularity. Since the mid-1980s, we have begun to accept that Halloween’s unique place in modern society (especially American society) merits attention beyond horror fiction and children’s books. Early celebrations of Halloween were filled with fear of evil spirits. Afraid to be alone, people gathered in groups and wore costumes in the hope that evil spirits would think they were also spirits and would ultimately leave them alone. The gatherings became quite merry and soon the evil spirits were forgotten. Children joined in the fun and eventually took over the holiday. Nothing else says Halloween quite like a witch mounted on a broomstick with a cat perched behind her. Nowadays, we laugh at witches. We have become accustomed to seeing them on television, in the theater and in comic movies. From “Bewitched” to “Charmed” with Alyssa Milano (I always had a crush on her) to “Witches of East End”, I love seeing witches on television creating havoc and using their amazing powers. As the leaves begin to fall and good little witches start dreaming of and preparing their costumes, it’s a good time to start thinking about what candy or other goodies you will give the ghosts, goblins, and superheroes that will soon be on your doorstep. Each year I create fun gift packages for the children to enjoy and share. Halloween is a special time of year–a time to let your imagination wander. Who doesn’t enjoy a masquerade party and a chance to become someone or something else for the night? Over the years I’ve created my own costumes, thrown successful parties and enjoyed the magic of giving candy to the children that visit my home. This is the most enjoyable part of Halloween for me. Therefore, I give special attention to the candy I give and how I present it to the children. Here’s an easy and simple idea to make the most of the candy giving process. Place the plastic containers in a row. Line each container with a napkin. 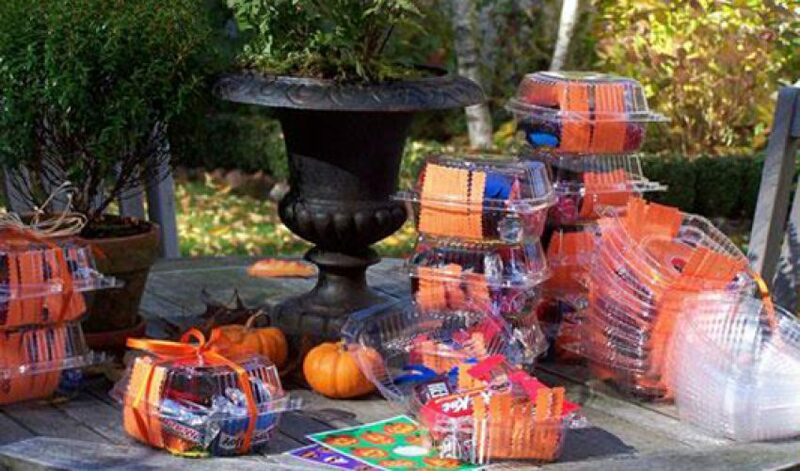 Place an assortment of candy in each container. Add the confetti, toys and spiders. You can fill all the containers the same or vary the contents just a bit. The only rule I have is to fill each container to the fullest capacity. Tie each container with ribbon and a pretty bow. The stickers can be used to seal the container, to add interest to the wrapping or just for fun. As the end of this month creeps up, carve out some fearsomely festive and wickedly wonderful pumpkins to enjoy in and outside the home. Although pumpkins can be kept in the fridge for a few days, it’s best to do this project as close to the 31st as possible to ensure that your Jack-o-lanterns don’t spoil. This is family project offers many opportunities to be creative and have some good old-fashioned fun. One last thought: I love to give the children a party glow necklace or bracelet, or a cube that will add light in the dark. When out “trick or treating” any light such as these is one more way to help make a child visible to moving vehicles. This small gift has the important added bonus of safety. Preparation is simple. Paying attention to the details makes the difference. Bundle decorative grasses from your garden with string to use as a natural autumn display rather than corn stalks. Not only is this free, but cutting now will help promote new growth in the spring. Carve your pumpkins with an opening at the bottom, not the top. This makes placing a candle inside much easier and safer. Don’t use color spider web mesh. I’ve only seen spiders produce white webs and this is what we should emulate.